The open prediction with a kicker twist! A RED backed "Prediction" card is removed from a BLUE deck and is isolated under the card box. In this manner, it remains in FULL VIEW at all times throughout the routine. Next, a spectator is asked to pick a card from the pack and signs her name across its face. The card is then lost in the pack. 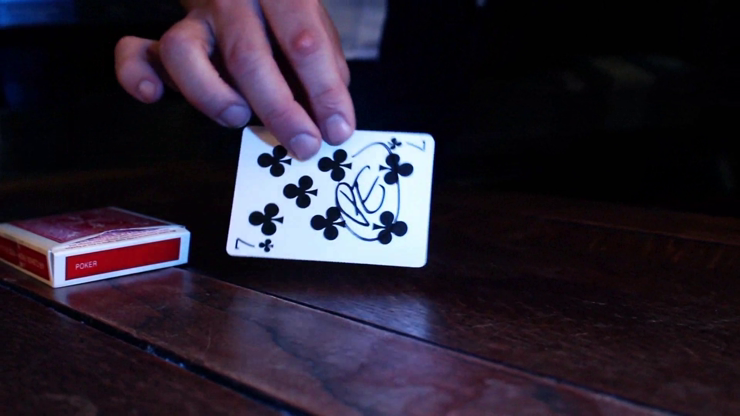 You ask your spectator: "Wouldn't it be an amazing trick if your signed card ends up INSIDE the card box?" You open the card box only to reveal it's empty. Undeterred, you continue by asking, "Would it be a good trick if your prediction would be the actual 'mate' of the spectator's card?" Let the spectator turn over the blue prediction card... only to reveal THEIR signed selection! Now THAT is a KILLER trick! Of course, the spectator may keep the card as a unique souvenir. PREVISION will hit them like a proverbial freight train! This routine is both FUN and EASY to do and will definitely fry your audience! The prediction card remains in FULL VIEW at all times! Use your own regular deck of cards! Automatic no sleight of hand invisible switch! Comes complete with PREVISION gimmick and online instructional video.